As I prepare to soon work from home, I've been doing a lot of research on home office ideas and have found a few fantastic sources for inspiration! Shown above and below, a favorite of mine: the Bedford Project Table Set from Pottery Barn! This versatile work table can be used for all kinds of different workrooms - craft workroom, an artists loft, scrap booking room, photography studio...I could go on and on! The open end shelving on each side is key, providing lots of storage, also allowing you to display your all your favorite things. 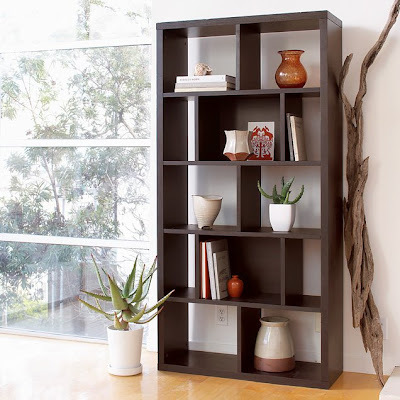 I absolutely adore this Rectangle Cutout Bookcase from West Elm. A twist on your traditional bookcase, have some fun displaying books & accessories by making them more of a focal point for your office. 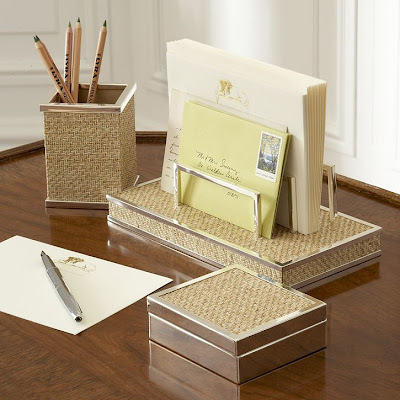 Replace the usual boring leather desk accessories with these clean, polished Silver Raffia Desk accessories courtesy of William Sonoma Home. 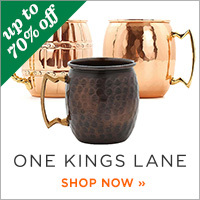 Team these up with the crystal lamp below and voila! you have a clean, sleek work space that's both functional and lovely. Who says you have to use old boring task lighting in your home office? 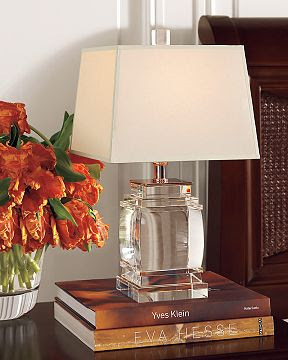 Add a little glam with Small Square Crystal Lamp from William Sonoma Home. I especially like it stacked on a couple of cool books as shown! 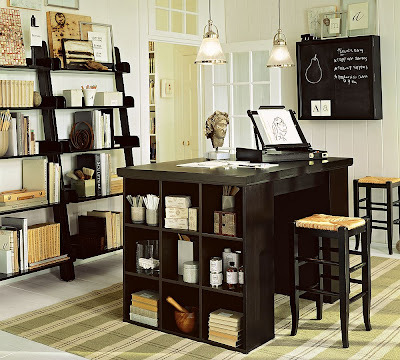 The Stanhope Library from William Sonoma is beautiful, clean lined and practical. I love the crisp white finish mixed with the bright pops of color! This combo creates a bright and fresh workspace that makes you want to sit down and actually work. The Framed Secretary from West Elm. 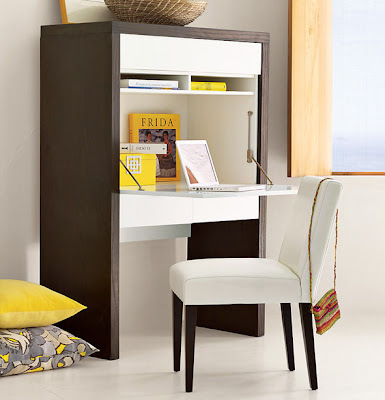 This super sleek, modern secretary is perfect for small spaces. Now if only I could keep my desk that clean! 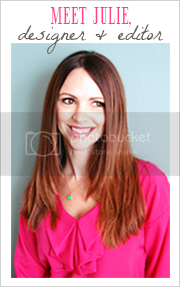 love the home office inspiration photos! 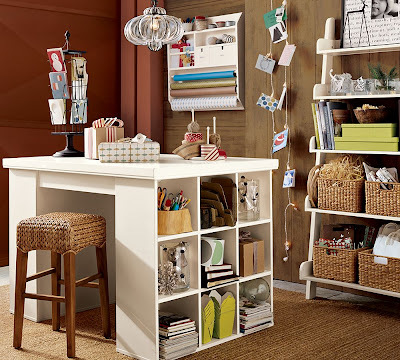 we'll be spending a lot of time at home very soon, and these ideas make for a lovely work space. I love home offices - the studio desk is great! These are GREAT offices! I'm going to work on mine... I will repost when things are straighten... even if it only lasts a day... I will hurry up and snap a pic! Thanks for stopping by my blog... good to find yours!